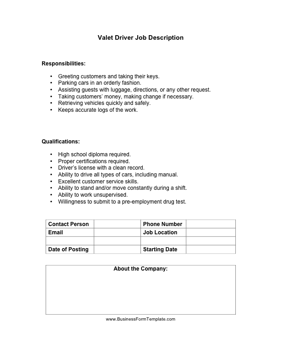 This job description outlines the basic responsibilities, duties and qualification requirements when hiring a valet driver for a nice restaurant, club or hotel. Greeting customers and taking their keys. Parking cars in an orderly fashion. Assisting guests with luggage, directions, or any other request. Taking customers' money, making change if necessary. Retrieving vehicles quickly and safely. Ability to drive all types of cars, including manual. Willingness to submit to a pre-employment drug test.